Hondarribia is a town just across the border from Saint-Jean-de-Luz into Spain, and on a promontory from where you can look across to France. It is reached by an attractive coastal road via Hendaye. We have included it here because it is a popular trip with people visiting the south-west corner of France. The city has been under siege many times (and always held out), the worst being in 1638. That siege was finished on 8 September, and to this day the date is celebrated in the town by a parade. 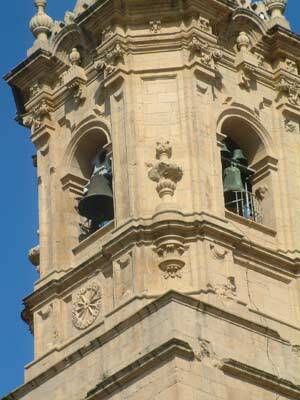 The city was known for many years as Fuenterrabia, but reverted to its basque name, Honderribia, in the 1980's. It's French name is Fontarrabie. 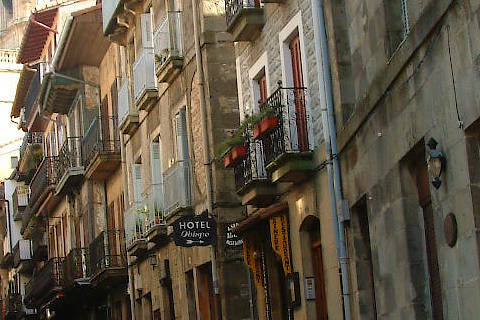 Hondarribia has been inhabited since prehistoric times. 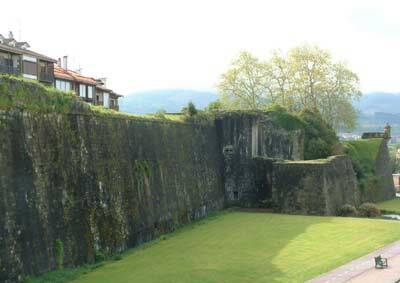 The fortifications that can now be seen, and many of the buildings, were built during the Renaissance. 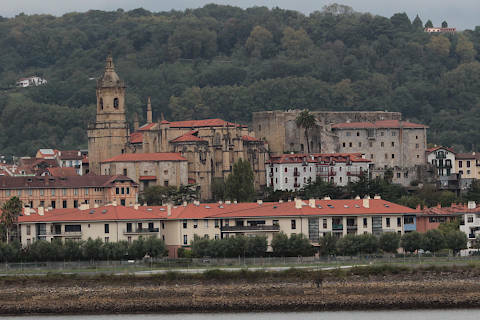 The city that has grown up around the medieval city of Hondarribia is less exciting, but the 'walled city' in the centre is a fascinating place. You enter the town centre through the Puerta de Santa Maria, a traditional fortified gateway that was built as part of the fortifications in the 15th century. 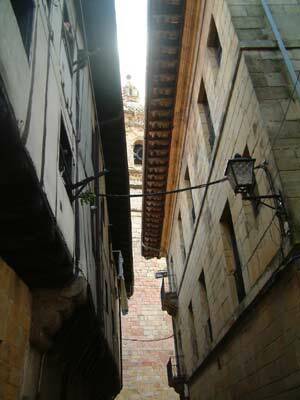 Hondarribia is a walled city that contains street after cobbled street of beautifully preserved and restored houses, all at the foot of an impressive church. 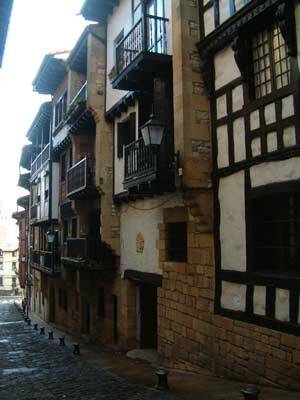 Many of the buildings have elaborate wooden or iron balconies, and carved eaves and throughout the old town you come across small squares where you can pause and take a coffee. One of the prettiest streets is the pedestrianised Calle San Pedro. The main square in the town is the Plaza de Armas, next to the church and castle, and a charming square which is surrounded by basque style townhouses and the centre of activity. 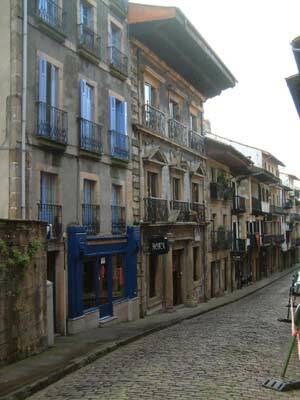 The tourist office for Hondarribia is also in this square. 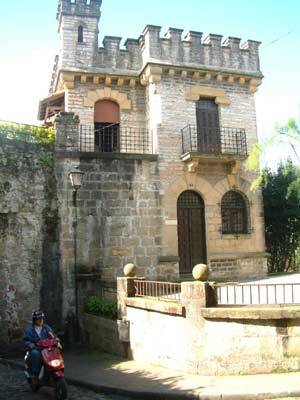 Close to the main square, one of the principal monuments in the town is the castle, called the Palacio de Carlos Quinto and built in the 10th century. The castle is now a luxury parador (a traditional style hotel in Spain) so the best way to see the castle is to book a room in the parador! After walking around admiring the city you can walk around the outside of the walls, now partly laid out as attractive gardens. The next part of your visit is the port area of Hondarribia, whih is surrounded by picturesque and brightly painted houses with balconies and even more colourful if you can visit in spring or summer when many of the houses also have flowers. There is also a long sandy beach in Hondarribia, which is very popular - but also overlooked by quite a lot of not very beautiful apartment blocks - so you might prefer some of the other beaches along the coast. 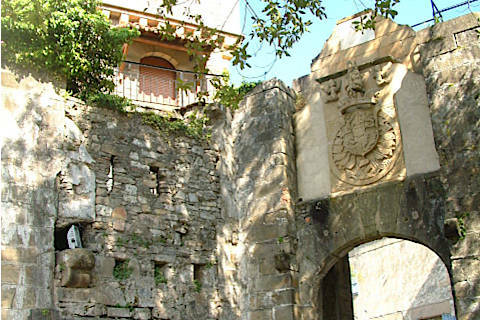 If you would like to learn more about the history of the town you can visit an information centre for Hondarribia in a 17th century gunpowder warehouse which has been restored. After you have completed your tour, continue to drive along the coast for a further 15km or so - the scenery is even better than the approach from Saint-Jean-de-Luz. The town of Hendaye is a boat trip (or a short car trip) from Hondarribia and has a beach and port to explore, and the town of Saint-Jean-de-Luz is one of our favourite seaside towns in France.